AN EFFICIENT FORWARD STROKE IS ESSENTIAL IF YOU ARE LOOKING TO BUILD YOUR SKILLS IN THE SPORT OF KAYAKING. IT WILL OPEN MORE OPPORTUNITIES FOR YOU TO PADDLE IN A LARGER VARIETY OF PLACES. Often paddlers come across conditions such as wind and current, requiring not only a strong consistent forward stroke, but in many cases a a burst of power to paddle across and eddy line or get through that strong wind gust. In this class we will not only work on improving forward progress, but also add corrective strokes and edging that will keep you moving forward when needed. Cost: Local Weekday Rate $99 Plus 6% booking company fee. Contact me for more info if needed. Coastal paddling is a team sport, in this class you will learn how to work as a team to set up play spots and handle situations if something goes wrong. In this class we will work on strategies to extract both yourself and your team from situations that could arise while paddling on the coast or rock gardening. You will build the confidence needed to play in dynamic coastal areas. We will work on assessing the teams skills and analyzing appropriate places for your team to have fun while playing on the coast. Location & Time: Near West Linn ready to paddle at 9:30am. Some of the best Rock Gardening in the world! For more info contact me or to save your spot BOOK NOW no fees will be charged until I contact you with more details and payment options. Prerequisite: Paddlers should be experienced with Surf Launching and Landing in 2-3 ft surf. Pending conditions, this class will take place near Ecola State Park. In the event of excessive coastal conditions, location may move south to Cascade Head. Location: TBD pending conditions - Possibilities include Cascade Head, Nehalem Bay, Seaside, Cape Falcon, Ecola Beach, Netarts. To paddle on the coast you need the ability to get from the shore to open water, and back. So on day 1 from 11-3 we will work on skills such as identifying and reading the surf zone, holding position in that zone, bracing, side surfing, surfing, launching & landing. On day 2&3, conditions permitting, we will discuss planning a trip and go beyond the surf zone to explore the open coast. Where we may find arches, caves, rock gardening, surfing and the ability to be where you have gazed while looking from the oceans shores. If conditions are too large to access the outer coast, we will explorer other options. We will focus on paddling as a team, including how to explorer the coast and give your team the skills to help out when someone is in need. Current coastal paddlers can also get a lot out of this class as each student will be have the opportunity to be individually challenged increasing and developing their skills. Contact me for more info. Lumpy Waters, can't wait for this fun event! This trip includes transportation from San Diego across the border and sea kayaks waiting for you. This class is scheduled on Wed to take advantage of the ideal tides. We will work on skills while paddling 2 miles with the end of the ebb current to the mouth of Nehalem Bay. Once arriving at the mouth, this venue offers a great progression from very small surf to the larger sets outside and a light flood current pushing away from the surf. Making it an ideal venue to gently up your skill level. Cost $125 Plus 6% booking company fee. (Minimum enrollment 2 - Max 3 students) Dressed and ready to paddle at 10am. Location & Time: Near West Linn ready to paddle at 10 am. Incident Mitigation, Management & Rescues- Cape Disappointment Wa. This course is designed to introduce paddlers to risk assessment, and tactics for managing safety while on the water. This includes ways to move groups safely through environments, repair boats, and perform rescues. This course will move your focus from personal skills, to thinking about the group and the environment. We will deal with developing the logical thought process and understanding of emotional influences on the group during a crisis. AN EFFICIENT FORWARD STROKE WILL OPEN MORE OPPORTUNITIES TO PADDLE A LARGE VARIETY OF PLACES AND IMPROVE YOUR OVERALL SKILLS. Unlike a racer in a surf ski, most sea kayaks are shorter without rudders which tends to let your kayak veer off course if only focusing on that perfect racing stroke. We will add subtle adjustments to the stroke and kayak to keep you moving forward. Proper technique ensures you can paddle faster, more efficiently and with less strain on your body. While the basics of this stroke are fairly simple it is one of the most difficult to refine to a high level of efficiency. The forward paddling stroke is our primary means of forward propulsion and the start point of every adventure. Whether paddling in high winds, touring, surfing, kayak fishing, or just on your local lake, you will need to use a forward stroke. Cost: $125 Plus 6% booking company fee. In this class we will practice the skills needed for one of the most dynamic and exciting styles of paddling and there is! And no better place in the world for it than the coast of Northern California! We will play with pour-overs (riding waves over rocks), learn how to use larger rocks for protection, work on judgment, timing and maneuvering in and around the rocks. We may get to explore caves and paddle through natural arches if sea conditions allow. The Coastal Kayak Surfing course is designed to teach paddlers how to read and surf waves with good boat control and increase comfort in the surf zone. We will work on skills while paddling 2 miles with the end of the ebb current to the mouth of Nehalem Bay. Once arriving at the mouth, this venue offers a great progression from very small surf to the larger sets outside and a light flood current pushing away from the surf. Making it an ideal venue to gently up your skill level. Cost $125 Plus 6% booking company fee. (Minimum enrollment 2 - Max 4 students) Dressed and ready to paddle at 9:30am. Expand your skills and comfort level to make playing in currents fun! We will work on reading the water, identifying and hazards and strategize on how to efficiently paddle in these dynamic conditions. Focusing on the specific supportive strokes, skills and maneuvers that can transform your paddling and give you the ability to explorer areas previously inaccessible. Location & Time: The Narrows - ready to paddle at 10 am. 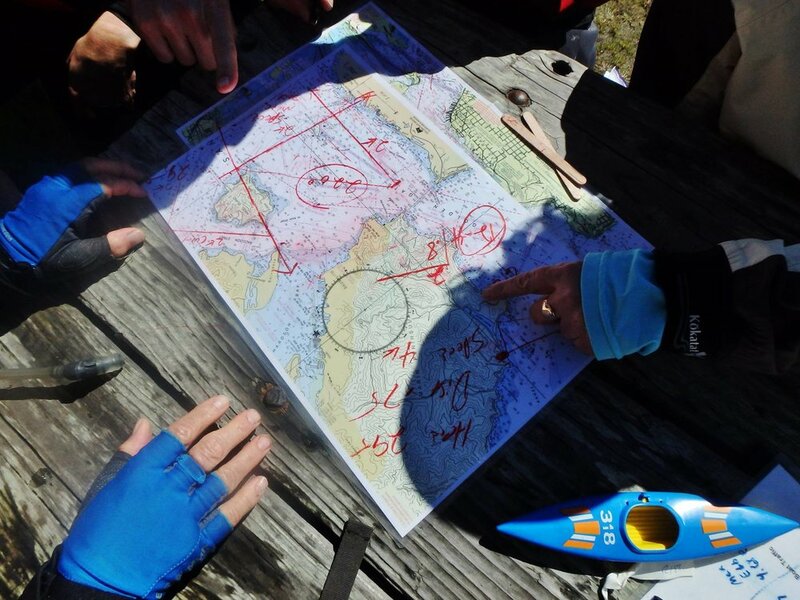 In this class you will learn to utilize and redefine core strokes and be introduced to advanced strokes, including supportive strokes, that will increase comfort and maneuverability in wind, currents and rough water, advancing your skills to the next level. Dynamic paddling builds on strong foundation skills. Learning how to to combine and blend strokes is a key element of becoming a dynamic paddler. Making the connection between core skills and new techniques will build confidence and a solid foundation. Location & Time: Tillamook Bay ready to paddle at 9:30 am. In this class we will work on a solid forward stroke to move you through wind that could come up whether planned, or not. We will also work on strokes and strategies to use the wind to turn and maneuver instead of fighting it. And of course the most fun, down wind runs and surfing! This class is a great oppertunity to gain skills needed for coastal paddling. In order to access many places on the coast, negotiating the surf zone is required. Also an emergency landing may be needed. Location: Pending conditions, this class will take place near Seaside OR. In the event of excessive coastal conditions, location may move south as far as Cascade Head. This class will give you a great introduction to one of the most dynamic and exciting styles of paddling. You get introduced to pour-overs (riding waves over rocks), learn how to use larger rocks for protection, work on judgment, timing and maneuvering in and around the rocks. We may get to explore caves and paddle through natural arches if sea conditions allow. This class will give you a great introduction to one of the most dynamic and exciting styles of paddling! Pending conditions, this class will take place near Ecola State Park. In the event of excessive coastal conditions, location may move south as far as Tillamook Bay or Cascade Head.